"I made this recipe one night when pressed for time. I had a taste for Asian flavors and not many ingredients in the pantry. Mildly spicy and super fast to prepare, this recipe is an easy after-work meal. 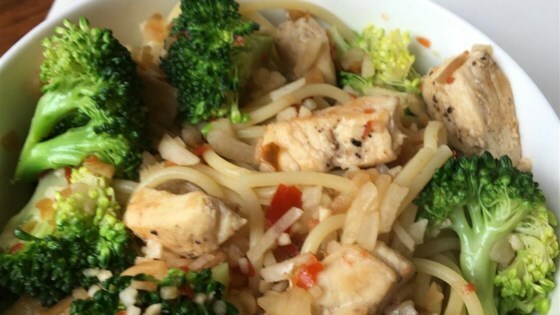 The type of protein or vegetable used could easily be adapted to whatever you have on hand!" Bring a large pot of lightly salted water to a boil. Cook spaghetti in the boiling water, stirring occasionally until tender yet firm to the bite, about 12 minutes. Drain. Bring 4 cups water to a boil in a separate pot; add chicken, onion soup mix, chile-garlic sauce, garlic, and ginger and mix well. Add broccoli and simmer for 5 minutes. Divide spaghetti into 4 bowls. Ladle soup over spaghetti. Chile-garlic sauce can be found in the Asian section of large grocery stores. I didn't have high hopes for this one, but was very surprised! Hubby and I both enjoyed it!